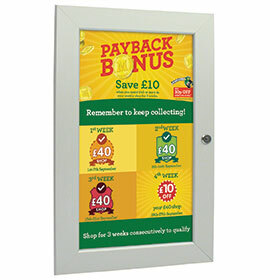 Attractive, single-sided convex lightbox for interchangeable posters or transparencies in a range of sizes. Suitable for internal wall mounting. Acrylic opal diffuser panel ensures even light distribution and a stylish look. Description All your D-Light will be sent as individual units by parcel delivery. Your D-Light will be sent in two separate deliveries – one by pallet, one by parcel. Keyholes at rear for easy installation, suitable for portrait or landscape displays. Silver finish steel case (RAL 9006). Acrylic opal diffuser panel ensures even light distribution. LED illumination gives low power consumption in use. 2m power cable plug, 12V power supply, wall fixings and CE certificate supplied with each unit. Custom sizes (minimum order quantity: 50). Custom colours (minimum order quantity: 5). 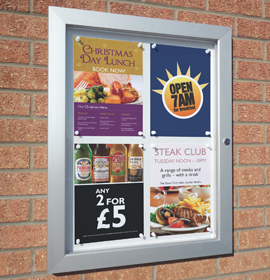 Maximum size 850 x 1250mm.